A left parietal Arachnoid cyst with typical imaging findings though location is uncommon. Clear cyst isodense to Csf. 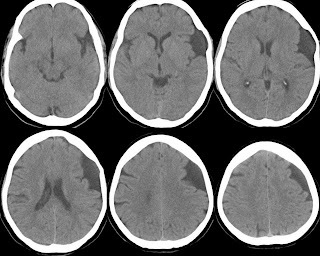 An associated hypoplastic adjacent left parietal lobe. Scalloping of inner table of bony calvarium. Not communicating with ventricular system. Adjacent brain parenchyma show normal attenuation. No Gliosis in surrounding brain parenchyma. Enhancement not expected on post contrast. Typical locations of Arachnoid cyst includes Middle cranial fossa and Cp angles. Case 1: A right middle cranial fossa Arachnoid cyst with an associated hypoplastic right temporal lobe. Case 2: A left side Cp angle Arachnoid cyst with an associated hypoplastic left cerebellar hemisphere. 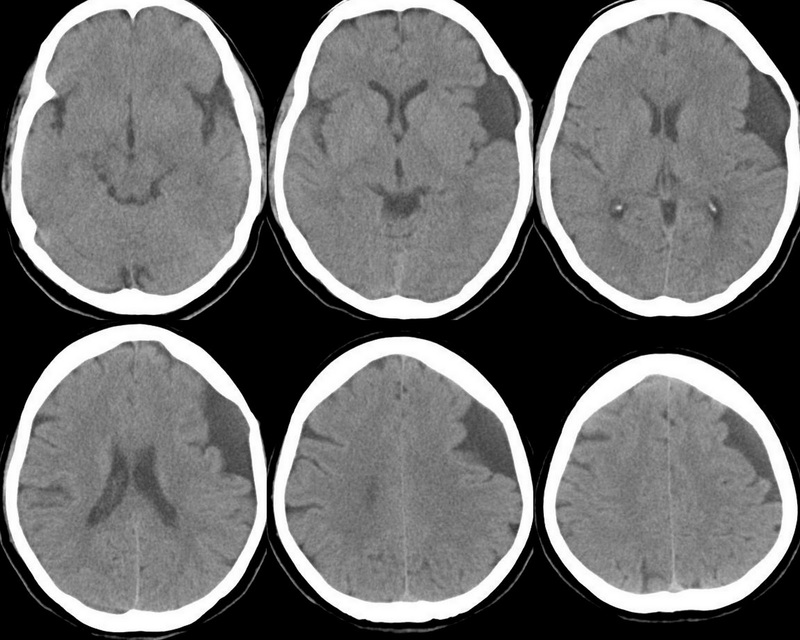 Arachnoid cysts have typical imaging findings as in these cases seen as a sharply demarcated cyst. Extra axial, does not communicate with ventricular system. Isointense to Csf on all pulse sequences. Complete suppression of fluid signal on FLAIR. No Gliosis in adjacent brain parenchyma. No volume loss. An associated hypoplastic adjacent temporal lobe or cerebellar hemisphere. May show an associated mild scalloping of inner table of adjacent bony calvarium. Usually no mass if any is mild, decently displaces adjacent vessels and nerves. Non enhancing on post contrast. 1. Epidermoid cyst which typically shows restricted diffusion MRI Diffusion. Mass effect on adjacent parenchyma instead of hypoplasia, insinuates in cisternal spaces, encases nerves and vessels implies to its plasticity. Signal suppression on MRI Flair may not be as complete as arachnoid cyst. 2. Porencephalic cyst show Gliosis in adjacent brain parenchyma and volume loss like ex vacuo dilatation of adjacent ventricle. May communicate with ventricular system. It’s a cortical area of Csf signals involves cortical grey white mater where as arachnoid is an extra axial lesion. 3. Neuroglial cyst is intra axial, rare, commonly seen in frontal lobes.